I’m James Alford, PhD. I’m an independent consultant who specializes in front-end product development research, that is, consumer research designed to identify new product opportunities and concepts. I typically serve as the principle investigator on research projects from start to finish. 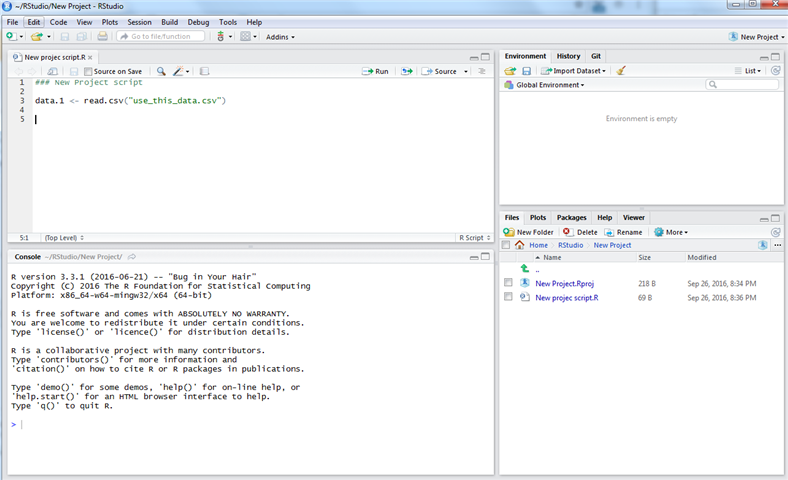 This involves authoring and programming surveys to implement advanced research techniques, statistical analysis of survey data, delivering predictive models in the form of interactive dashboards, and a final research report. 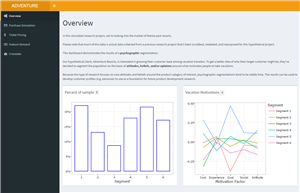 This site provides an overview of a number of different research methodologies I use, along with example surveys and dashboards when applicable. I’m a believer in “qual-quant” cycle. We learn about customers by talking with them. We use those findings to make statistical inferences about the larger population with survey research. A well designed survey incorporates learnings from qualitative research so that the response options available to survey takers accurately reflects both the language and the breadth of responses customers give in an in-person conversation. The quantitative data collected through survey research reveals patterns and potential opportunities in the market. We use the survey findings to identify customer types who might find added value in a new product feature, concept, or improvement. Follow-up qualitative research with representative customers verifies the opportunity to provide added value and informs design concepts. 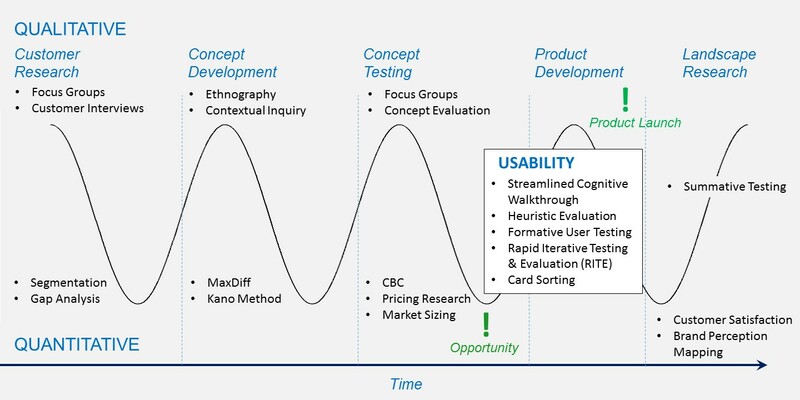 This cycle of qualitative and quantitative learning minimizes risks associated with product development by verifying the added value of new features and/or concepts before production begins. Are you early in the development process, or interested in having a deeper understanding of your end users? Segmentation is front-end product development research that helps identify customer subgroups in the market that have similar characteristics. Target segments can be identified and studied further, with the end goal of discovering new product concepts and/or features that these subgroups will highly value. Are you interested in finding new product/feature opportunities? Would you like to learn which product attributes are failing to meet customer expectations (underserved)? Gap analysis, or unmet needs analysis, is exploratory front-end product development research that measures deficiencies of a broad spectrum of product attributes in a category. These deficiency scores can be used to identify immediate areas for improvement in an existing product line or opportunities for development of new features for a future product line. You’ve identified a number of product concepts, features, or user stories. Which of these should be prioritized for a feature backlog? Which concepts are the most promising, suggesting follow-up pricing research? MaxDiff is a method for scaling a large number of items (15-20) by preference or importance. Are your preparing to launch a product or service with features that are new to the marketplace? Are there more of these features than can be developed before launch? How do you prioritize which features need to be included in the initial launch and which ones can wait for future updates? The Kano Model can be used to categorize features as ‘Must-Have’, ‘Delighters’, and more. You’re in a highly competitive industry. Not only does the next version of your product need to offer more value to end users than your current version, but it needs to outperform your competitors as well. User research has identified new feature concepts that your customers are responsive to. Incremental improvements in existing features are also an option. Which version of the product should you go to market with? Which version would win you market share versus your competitors? Which version would bring in the most additional revenue? If this describes your situation, then you might benefit from Choice Based Conjoint Analysis (CBC). You’ve looked at how customers use products in your category and have created new concepts that will make for a better experience. You’ve tested these concepts with end users and verified that these are changes they’d like to see. But is this a real business opportunity? How much value would these features add? How much would your end users expect to pay for these changes? The van Westendorp Price Sensitivity Meter can be used learn what range of prices customers would consider reasonable. How does your product stand up to walk-up-and-use evaluation? Streamlined cognitive walkthrough is a discount usability method that is used to test the learnability of an interface near the beginning of the design prototyping process. Quickly identify big user issues in your product and make sure it conforms to User Experience best practices. 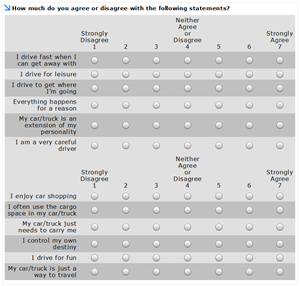 Can your users in fact use your product and how satisfied are they with it? If there are issues with it, what are they and should be done to resolve them? For when you don’t have much time but still want to test with real users to find issues with my product and are willing to put in some sweat-equity to move things along quickly. How do people think about the different sorts of information that are incorporated into my product? How should that information be organized in my product so that people can find what they need when they need it? You’re an established brand and are looking to make sure your company is positioned correctly in the marketplace. You have an idea of what distinguishes you from competing brands, but aren’t sure whether your customers view your brand the same way. How do customers perceive the marketplace? What brand personality attributes are the most important for distinguishing between brands? How do these attributes relate to each other? Most importantly, is your brand positioned correctly to accentuate your company’s strengths relative to your competitors? Brand Perception Mapping can be used to address these questions. How usable and satisfying is my finished product and how does it stack up against the competition? Click on the thumbnails below to see example dashboards in action! I code my dashboards in R and host them using Shiny. Please note that I’m currently using the open source version of Shiny Server. This limits the amount of server calls at a time, which can unfortunately lead to longer load times if many people are viewing the dashboard at once. 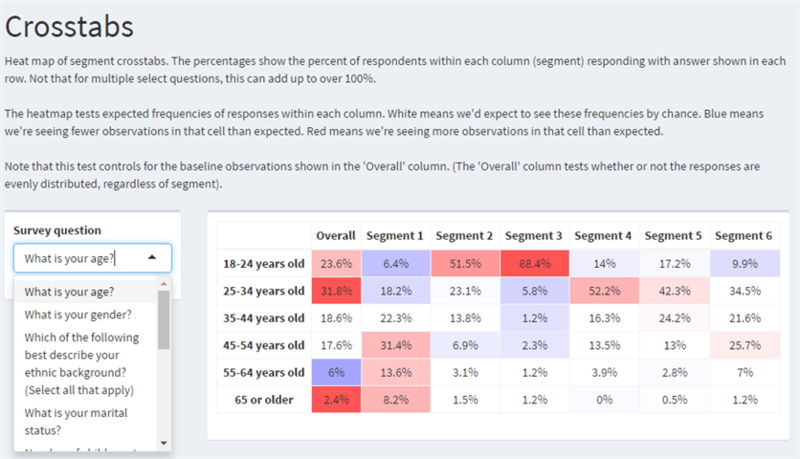 This sample dashboard demonstrates the results of a large market segmentation study. Methods showcased include choice-based-conjoint (CBC) and the van Westendorp price sensitivity meter. Click on the thumbnails below to see example surveys! 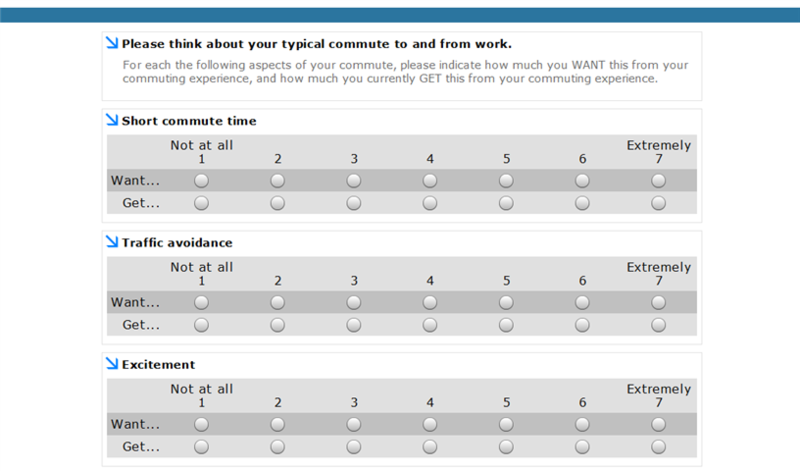 These surveys were programmed using Sawtooth Software. 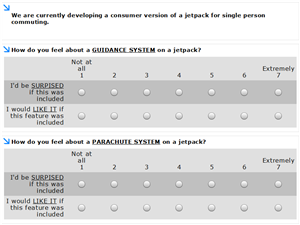 This sample survey showcases an example of psychographic segmentation research for a new product line of jetpacks. 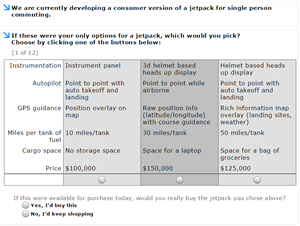 The market will be described in terms of attitudes towards driving, with the working hypothesis that adventurous commuters might be a good target segment for jetpacks. This survey examines current unmet needs with communting to and from work. This information is designed to inform production of a new line of jetpacks. MaxDiff is a good method to use when you have a large number of features for development but can only focus on the most promising ones. 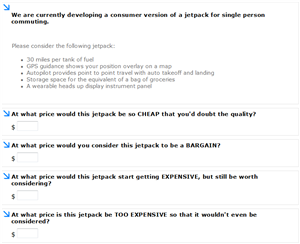 This survey asks potential jetpack consumers to rank which jetpack features are most important to them when considering a purchase. Only available with Sawtooth Software. "Delighters" are loosely defined as those product features that surpass expectations, providing unexpected value. This survey demonstrates a variation on the Kano Model. The Kano Model has had success in identifying those features which, if included, can add to the "Wow!" of an initial release. This survey demonstrates a purchase simulation (CBC) that asks respondents to make the same types of choices they make in the real world when comparing products. From these results, we learn which features drive preference, which allows us to estimate market share relative to other products in the market. Only available with Sawtooth Software. 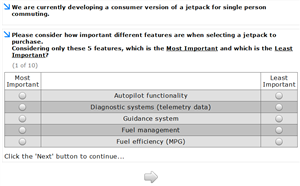 This survey shows an example of the van Westendorp Price Sensitivity Meter, which in this case, is designed to learn the range of acceptable prices for a new commuter jetpack. 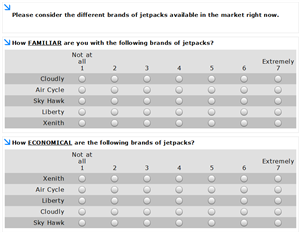 This survey uses a hypothetical jetpack market to show how to collect the data needed to build a perceptual map of different brands in the marketplace. 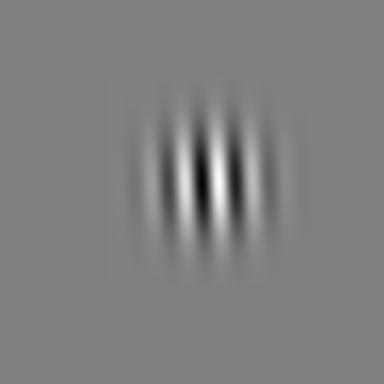 Is the shape below rotated to the right or the left? The process by which our nervous system converts physical stimuli to neural activity is referred to as sensation, but making sense of that information is referred to as perception. 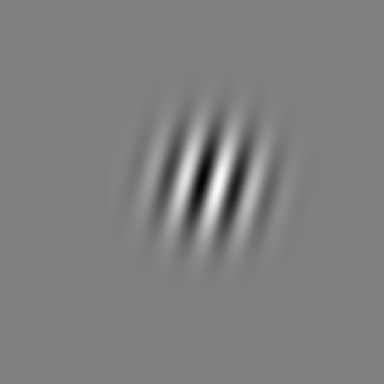 The field of studying how physical differences in stimuli affect perception is called psychophysics, and one of the research techniques for studying this is signal detection theory. The ideas behind signal detection theory occur frequently in user research, so they’re worth reviewing here. Whether we’re trying to detect whether a product change influences user satisfaction, or trying to measure preference for a product design, having a good understanding of signal detection theory serves as a foundation for future research method discussions. Most importantly, the same scientific rigors used to measure perceptions can be used to measure preferences. After all, isn’t preference just a type of perception, as in, perceived benefit, or perceived value? This is where I’ll be announcing new content on the site, as well as any articles and/or essays I might write. If you have any upcoming research projects that I can help with, please email me at james.alford@unabashedresearch.com or call 1-206-429-9112 and ask to speak to a representative. I prefer to charge a flat fee per contract based on the scope of the research needed. Also, please keep in mind that third party expenses may increase project costs. Examples include paying for general population sample survey completions, survey authoring software licensing fees, gratuities for qualitative research participants, focus group research facilities, and so on. I'm a believer that research should be specific and actionable. Before engaging in any research, I like to have a "drill-down" meeting with key stakeholders to learn more about the research needs. 1. What are the research goals? 2. Why are these the research goals? In other words, what business metrics if any will this research inform? How will knowing this improve your business? 3. How will the research be used? What business decisions will this research inform? 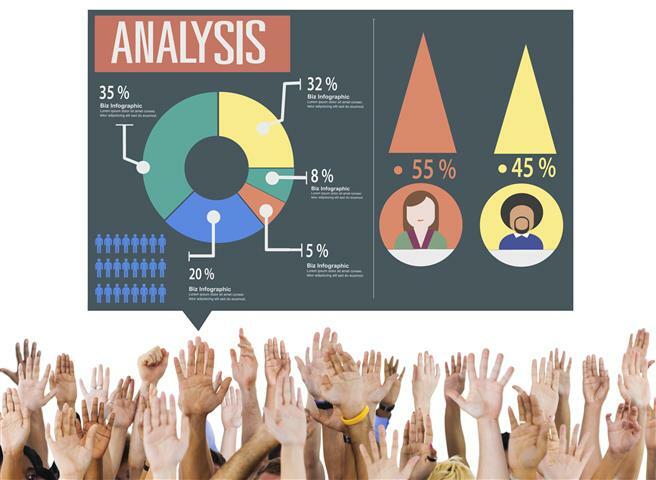 I often find that clients expect research to deliver a one-off snapshot of their customers, a report detailing the descriptive statistics of their customers and their responses in the form of crosstabs and bar charts. But more often than not, when given the opportunity, what clients would really like is to be able to predict changes in business metrics based on "what-if" scenarios. So if we start the WHY of the research, we work backwards. What would we like to predict -> what data do we need to build a predictive statistical model -> build survey around getting the needed data. I've found this approach successful in delivering research findings that are immediately actionable and impactful. 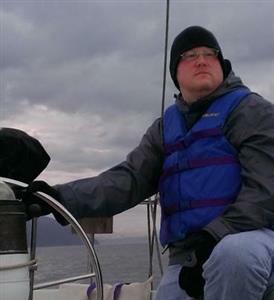 I have had the pleasure of working with James, Founder and Principal of Unabashed Research, side-by-side at a previous company. James is not only a top-notch professional with a set of extremely rare analytical skills, but also someone who can explain very complex technical concepts in a simple and easy to understand way. His professionalism and work ethic are unparalleled. Zappos hired James and Unabashed Research to partner in conducting some extremely important and pivotal market research at a time when Zappos was transitioning to a new business strategy. James stepped up and delivered end-to-end results in an astonishingly compressed time frame – 5 weeks from research conception to final deliverables. This speed of delivery is quite unique, compared to 12 to 15 weeks turnaround time for most full-service market research companies. The results of the research James conducted were used to form the new Zappos strategy and are now continually used to focus the company on key customer segments. I would work with James and Unabashed Research again in a heartbeat. After receiving my doctorate in Cognitive Neuroscience in 2006 from the University of Oregon, I began to apply my skills to the corporate world. I consulted at Microsoft Hardware as a quantitative user researcher until 2011, when I left to accept a full time position as the in-house market researcher for Active Network. After being asked to relocate in 2014 when the local office was downsized, I decided it was time to move on. A short time later, I was asked to consult on a major market segmentation project and Unabashed Research was born!